While summer may still be in full swing, the new school year is going to be here before we know it. My oldest daughter will be going into fourth grade and my youngest daughter will be going to first grade! We’re all really excited, but we’re all a little nervous too. One thing I’m not too nervous about, however, is buying new back to school clothes . Sure she’s going to need a ton of them (How girls go through clothes so fast–I’ll never know! ), but that’s okay. I won’t be paying full price for them, and you don’t have to either. Just use these seven ways to save on back to school clothes. I plan to save a bundle, and you can too. One of the easiest ways to save big on your kids’ school clothes is ridiculously simple: shop the sales and clearance racks! You can often get the exact same brand new name brand clothing for a fraction of the cost just by waiting a couple of weeks until it goes on sale. Find out when your favorite store marks everything down, and go in ready to stock up and save big! 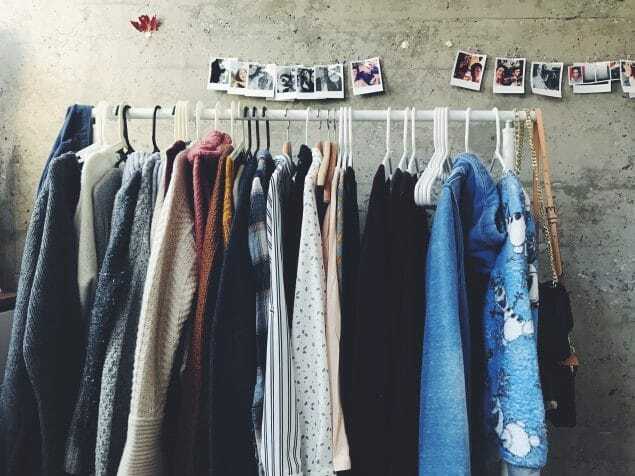 If you don’t mind used clothes, there are tons of places you can find them. Search thrift stores, consignment shops and secondhand kids’ clothing stores. Hit up the garage sales and search on Craigslist and Ebay. How many times have your kids grown out of clothes before they’ve had a chance to wear them more than a couple of times? This happens to other moms too, and you can use it to your advantage. If you really want to save big and you have friends with kids who are slightly older than yours, see if you can trade or get free hand-me-downs. I’ve gotten tons of clothes from friends who were willing to let me borrow as well as from friends who just wanted someone to take the clothes off of their hands for free! Watch my video to see how I get clothing for FREE with swaps. If you have adequate storage space and are good at planning ahead, buying all throughout the year is a fantastic way to save big on kids’ clothes . For example, if I see a shirt on clearance that is two sizes too big for my daughter but a great deal, I’ll go ahead and grab it now. Then, when the time comes, I don’t have to buy clothes at full price–she already has a whole box full of clothes I’ve picked up for cheap! This does require excellent organizational skills, but it can be done. When you see the price tag on a new pair of jeans , it can be really tempting to just purchase the cheapest pair you can find, but resist the temptation! Often times you get what you pay for, and it ends up being much cheaper and easier to buy quality pieces in the first place. If there is a store you shop frequently, make sure you sign up for their sale alerts, newsletter or coupons–whatever they offer. Some stores send out free $10 coupons or $10 off of a $25 purchase coupons to their mailing list subscribers. Get a coupon like this, and you can get clothes for F.R.E.E! How frustrating is it to buy clothes, only to have them go on sale immediately after? Fight back by saving your receipt. Then, if something goes on sale two weeks later, you can just take the receipt back and get the difference. Honestly, if you are clever and resourceful enough, you really don’t have to pay more for kids’ clothes than you want to. These seven tips will get you off to a great start.